Samuel Finley Vinton was a member of the United States House of Representatives from Ohio from March 4, 1823 to March 3, 1837 and again from March 4, 1843 to March 3, 1851. Charles Gordon Atherton was a Democratic Representative and Senator from New Hampshire. James Graham a Congressional Representative from North Carolina; born in Lincoln County, North Carolina, January 7, 1793; brother of William Alexander Graham; pursued classical studies and graduated from the University of North Carolina at Chapel Hill in 1814; studied law; was admitted to the bar in 1818 and commenced practice in Rutherford County, North Carolina; member of the State house of representatives in 1822, 1823, 1824, 1828, and 1829; elected as a National Republican to the Twenty-third Congress ; presented credentials as a National Republican Member-elect to the Twenty-fourth Congress and served from March 4, 1835, to March 29, 1836, when the seat was declared vacant; subsequently elected as a National Republican to the same Congress; reelected as a Whig to the Twenty-fifth, Twenty-sixth, and Twenty-seventh Congresses and served from December 5, 1836, to March 3, 1843; chairman, Committee on Public Expenditures ; unsuccessful candidate for reelection in 1842 to the Twenty-eighth Congress; elected as a Whig to the Twenty-ninth Congress ; was not a candidate for renomination in 1846; engaged in agricultural pursuits near Rutherfordton, North Carolina, where he died September 25, 1851. 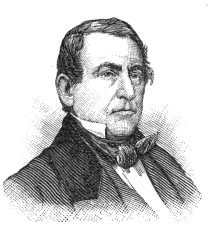 James Dixon was a United States Representative and Senator from Connecticut. Thomas Hart Ruffin was a Congressional Representative from North Carolina; born in Louisburg, North Carolina, September 9, 1820; attended the common schools; graduated from the University of North Carolina Law School, Chapel Hill, North Carolina, 1841; lawyer, private practice; circuit attorney of the seventh judicial district of the state of Missouri 1844-1848; elected as a Democrat to the Thirty-third and to the three succeeding Congresses ; delegate to the Confederate Provisional Congress at Richmond, Va., in July 1861; during the American Civil War served in the Confederate Army as colonel of the First North Carolina Cavalry, Confederate States of America; mortally wounded in action on October 14, 1863, at Auburn, Virginia; died October 17, 1863 in Grace Church Hospital, Alexandria, Virginia; interment in the private cemetery on the Ruffin homestead, near Louisburg, N.C.
Meredith Poindexter Gentry was an American politician who represented Tennessee's eighth and seventh districts in the United States House of Representatives. William Brown Maclay was a United States Representative from New York. Born in New York City, he received private instruction and was graduated from the College of the City of New York in 1836. He was associate editor of the New York Quarterly Review in 1836, taught Latin, studied law, was admitted to the bar in 1839 and commenced the practice of his profession in New York City. He was a member of the New York State Assembly from 1840 to 1842 and was elected as a Democrat to the Twenty-eighth, Twenty-ninth, and Thirtieth Congresses, holding office from March 4, 1843 to March 3, 1849. He was an unsuccessful candidate for reelection in 1848 to the Thirty-first Congress, and was elected to the Thirty-fifth and Thirty-sixth Congresses, holding office from March 4, 1857 to March 4, 1861. He was not a candidate for reelection in 1860 to the Thirty-seventh Congress, and in 1882 died in New York City. Interment was in Green-Wood Cemetery, Brooklyn. Edward Wilson McGaughey was a U.S. Representative from Indiana. Edward White Robertson was a United States Representative from Louisiana. He was also the father of Samuel Matthews Robertson.